In 1946, the British Army School was established in several homes in the Glyfada area to educate the children of British military personnel who were stationed in Greece at the close of the Second World War. The history of ACS begins here; for shortly after its inauguration, the school began to admit British and American civilians. In 1949, many more American children arrived in Greece, and a high school was opened for them in Kolonaki. Also established was an elementary school , in Psychico, which was later moved to a facility in Filothei. The British Army School had metamorphosed into the Anglo-American school. 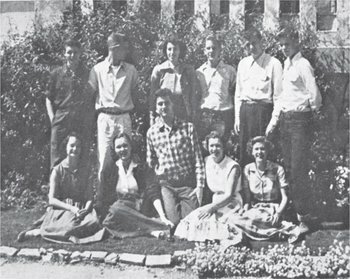 The first yearbook of the new school, The Evzone, published in 1952, highlights the accomplishments of a graduating class of six seniors who had graduated from a school that now occupied a rented villa in Kifissia. (This house, complete with towers and turrets, served as the school's home until 1961.) The same yearbook also documents the activities of Junior School students in a facility in Kalamaki for the children of the American military, which would serve as the home of the Junior School until its operations were transferred to a building on the American base later in the decade following an airplane accident. The 1954-55 school year marked another milestone in the history of the school. Chartered in the state of Delaware as a private, non-profit educational institution for the children of American diplomatic and military personnel, the Anglo-American School became the American Community Schools of Athens. From its inception, the school received no official subsidies, and its operations were funded by tuition fees. The school governance was determined by an elected board. According to its constitution, ACS Athens was governed by a Board of Education, comprising eleven members elected by the ACS Parent Association. In December 1960, the ACS School Board obtained funds under Public Law 480 to purchase land in Halandri, then a sleepy farming area, and began construction of a new school facility. The Class of 1962 was the first to graduate from the new facility. The currently elected Board of Trustees maintains its position of supporting the school’s president in making transformative decisions that shape the continued improvement of site facilities. The 1962 Evzone contains the following paragraph: This year's graduating class is the first to hold commencement exercises at the new American Academy located in the suburb of Halandri, approximately seven miles from the center of Athens. They were among 380 students who proudly took possession of the new building last September. 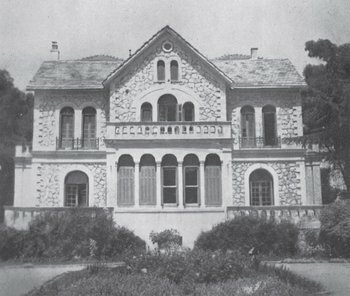 Two-storied, containing twelve modern classrooms, two science laboratories, a library and a study hall, the building replaced an ancient villa in Kifissia on Tatoi Road which overflowed into four very unscholarly army huts. In the rear of our new school is a spacious playground area...By late spring of 1962, it appears that a new junior school will be erected on our present grounds, plus a gymnasium/auditorium. A photograph of the campus in this same yearbook shows the new school building surrounded by open fields dotted with a few farmhouses. In fact, until the early 1980's, ACS students would follow the rituals of the school day to the accompaniment of the sound of bells clanging from the necks of the flocks of sheep and goats pastured in the neighboring fields. The Sixties saw a continued expansion of the Halandri facilities. The Middle School was built in its present location in 1962; this was followed by the erection of the gymnasium the following year. In 1964, the first two stories of the current Annex building were erected to house an elementary school. The first two stories of the current Elementary School were built in 1968. Throughout these years, ACS Athens continued to operate separate Elementary School facilities in Kifissia and on base. In 1968, yet another branch of ACS Athens was established on the island of Rhodes, for the approximately thirty children of Voice of America personnel stationed there. This branch of the school operated until 1981. In 1963, The Greek government officially licensed the school to provide education to the children of Americans in official capacities. 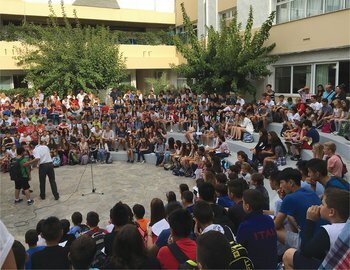 During that year, the school also began to admit students from the wider American and international expatriate communities in Greece, and ACS Athens began to take on an international flavor within the framework of an American school. The school grew to accommodate approximately 2,700 students in grades K-12. In the early eighties, the original license was amended, and ACS Athens was officially recognized by the Greek Ministry of Education as an educational institution for the international community in Greece, and in 1964, the Middle States Association of Schools and Colleges accredited the high school. At the time, ACS Athens was one of only two international schools so distinguished. When, in 1983, the Middle States Association had expanded its accrediting authority to cover elementary and middle schools, ACS received accreditation for its K-12 program. The decade of the Seventies found ACS engaged in its most ambitious building program. In 1974, the school’s directors committed themselves to a development plan which resulted in the building of the structural bridge, containing science labs, administrative offices and a conference room. This bridge connected the Academy and the Middle School; the current cafeteria, which originally served as the library; the amphitheater; and finally, the current library and fine arts classrooms. Additions the Annex and Elementary School buildings during the Seventies helped to modernize these sections of the campus as well. The school's academic program was expanded during these years also: in 1976, ACS Athens became the only school in Greece to offer students the opportunity to earn an International Baccalaureate diploma as they pursued their high school studies. In 1978, the Department of Defense assumed control of the operation of the base school; at the same time, the international mix of the student body was enhanced by the arrival of a large Arabic community in the Athens area. 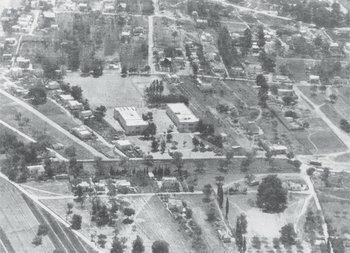 In 1980, ACS Athens purchased the land where the tennis courts are now situated. The Boarding Unit, originally housed in a hotel near the airport in Glyfada, opened in 1981. As a result, the student body expanded to include many children of expatriate Americans and foreign personnel working in the oil fields of the Arabian Peninsula. As a major curricular innovation, ACS Athens established the ACS Writing Project to promote the teaching of writing as a tool for learning across the disciplines in 1985. Two years later, ACS would earn the distinction of being selected as a sponsor of an International Writing Project site, with ACS Athens faculty engaged in training teachers from international schools around the world in Writing Project theory and methods. The Carnegie Commission for Promoting Excellence in Education recognized the quality of the school’s academic program by awarding ACS Athens two citations for excellence during the latter part of the decade. 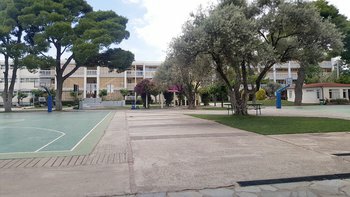 In 1986, ACS Athens closed the Kifissia Elementary School, and all school operations were consolidated on the Halandri campus, which had been expanded yet again with the building of new computer labs adjacent to the library. The current decade has brought with it its own share of changes. The purchase, in 1988, of the public road which divided the campus allowed for the building of the central Plaza which unified the campus into an integrated whole. 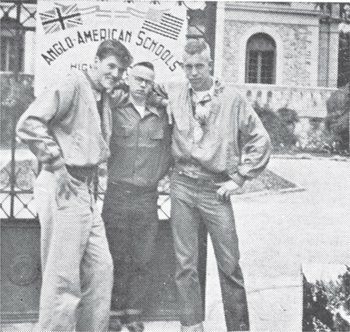 The closing of the American military bases during the 1992-93 school year, coupled with the Greek government’s decision to allow Greek citizens to attend ACS after completion of their compulsory education, resulted in yet another transformation in the complexion of the student body. While preserving its American character in philosophy and programs, ACS, home to students representing over forty-five countries, was also ready to define itself as "The International School in Greece." "50 Years of Excellence in Education"
In 1994, representatives of various constituencies in the community - faculty, administrators, parents, board members and students - developed ACS 2000, a strategic plan to guide the school's development as it moves into its second half century of existence. Faculty members embarked on an ambitious five-year curriculum development project to create a truly integrated curriculum which will prepare our students to face the challenges awaiting them as world citizens in the next century. In 2000, as a result of this work, the ACS faculty proposed and the Board of Education approved implementation of the International Baccalaureate Primary and Middle Years Programs in grades JK-10. These programs were enacted over a (five year period) at ACS Athens. And though none of us in the ACS community - and this includes all who have been involved in the nurturing of a vision that was born with the founding of that first small school in 1946 - can predict the changes the next fifty years will bring, we have reason to be optimistic that the solid foundation of tradition and innovation which has marked our development during these past fifty years will serve us well as we build our future. Now, more than 6 decades after the school’s founding, the ACS Athens' facility developments include a stunning state-of-the-art theater, conference rooms, an Olympic regulation swimming pool and a gym, funded by generous donors. Technology developments make it possible for faculty and students to enjoy wireless internet throughout the main library, cafeteria and lobby areas of the campus in addition to having high speed internet access to every computer station. Since the development of ACS 2000, ACS Athens has embarked on a program of steady curricular innovations that has prepared students to enter the top universities in the UK, North America and around the world. For the past five years, the ACS Athens Senior class college acceptance rate has hovered between 90-100%. Most ACS Athens students find themselves in their first or second choice school. This prime selection process is the result of strong, academic preparation, extensive counseling services and the opportunity to participate in a wide range of cultural, social, athletic and service activities. Another milestone in ACS Athens’ history occurred in 2004, when ACS Athens was authorized by the Greek Ministry of Education to offer classes and examinations leading to awarding the Greek high school diploma -the Apolytirio. Since its founding, ACS Athens has been devoted to staff development as well as student development. In support of the school’s efforts, the US Office of Overseas Schools established and funds a summer collaborative program that incorporates well-renowned US universities. This program is offered to faculty members of American International schools and it operates in Europe and Near East/South Asia. With increasing enrollment, administrative restructuring, superb academic programs, outstanding instruction, excellent athletics, world-renowned cultural and art programs, financial stability and critical and creative thinkers, ACS Athens continues to serve as a lighthouse model for “leading innovation in education."